Back in the days when floppy disks were still being commonly used, flashing your motherboard’s BIOS could only be done by booting the computer into DOS. When DOS is booted up on the computer, you’d probably have to switch to the floppy disk that contains the BIOS update file. Unlike today where updating a modern BIOS is far easier and convenient and you can update the BIOS directly from Windows using the software provided by the manufacturer, or simply put the BIOS file onto a USB flash drive and the inbuilt flashing tool inside the BIOS will recognize it. If for some reason the software provided by the motherboard manufacturer is broken and you’re not able to update the BIOS from Windows, or your BIOS doesn’t actually support flashing from any other medium apart from a floppy drive and DOS, you can still do it from DOS by booting up the computer with a USB flash drive instead of a floppy which is far easier. The most popular and easiest ways are to simply install MS-DOS or FreeDOS onto the USB drive, copy over the required BIOS file and flashing utility from the manufacturer’s website, boot to USB and flash the BIOS from there. Thankfully, there are tools around that can help you accomplish this with the minimum of effort, and not lead you through a huge multiple step process full of manual commands. 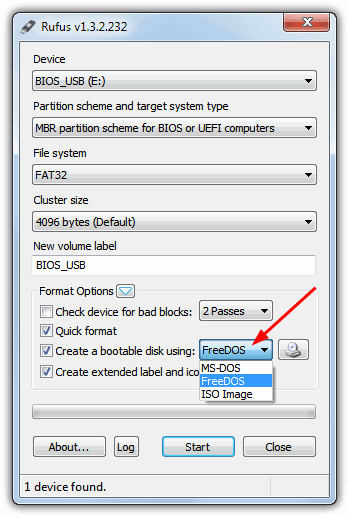 Here are 5 such tools that will put either FreeDOS or MS-DOS onto a bootable USB flash drive allowing you to update the BIOS firmware from DOS but without a floppy drive. Rufus is a small utility that helps format and create bootable USB flash drives, such as USB keys/pendrives, memory sticks, etc. It’s also a useful tool to help install different versions of Windows via USB and can also check USB devices for errors. It is a small, single and self contained portable executable file and the user interface resembles the Format tool in Windows. WinUSB Maker is by Josh Cell Softwares who produce some very useful Windows tools such as Advanced Tokens Manager and WinOwnerShip, and this tool can install the setup files for Windows XP up to Windows 8 setup onto USB, install the GRUB loader onto USB, create a full backup and restore of USB devices, and also do what we’re looking for, install MS-DOS onto a USB stick. 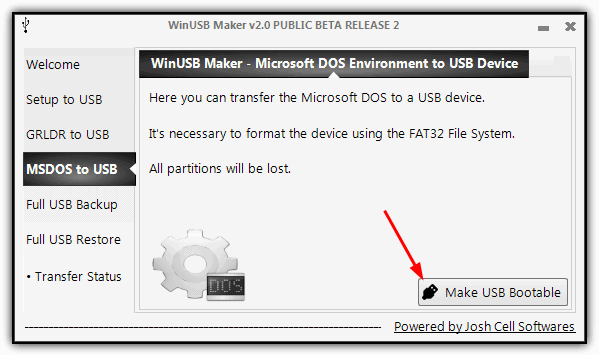 Like the other tools, WinUSB Maker is a standalone tool (although it does require the .NET Framework version 4 to run), simply launch it after inserting the USB drive and select it from the drop down in the Welcome screen. Then click on MSDOS to USB down the left and click the “Make USB Bootable” button, and accept the data will be lost warning. After a few seconds, you’ll have a DOS USB ready for the BIOS files. On UEFI motherboards, to boot into FreeDOS, you need to activate the Compatibility Support Module (CSM), which enabled BIOS features in UEFI. Also, in Secure Boot options, select “Other OS”. If you installed Windows while in UEFI mode, don’t forget to revert the aforementioned UEFI settings back, before you reboot into Windows, to prevent unpredictable problems. Doesn’t look like any of these can format the USB drive to pretend to be the A: drive. That’s a requirement on some systems like certain thin clients. If you boot from USB with a device that assumes the C: drive, they won’t allow anything to touch their internal storage. That’s usually an IDE (2.5″ connector) or SATA Disk On Module. A DOM is like a SSD but generally made with chips not meant to be written to umpty-thousand times. It works all over my computer. Thanks Ray.